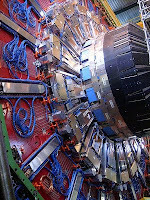 I'm going to be really nerdy an assume more than a handful of my readers are familiar with the Large Hadron Collider. For those not in the know, the LHC is the largest particle accelerator in the world. It is operated by CERN and sits on (or rather under) the French/Swiss border. The LHC was built to smash protons together at 99.9999991% the speed of light to split then into parts we we can learn more about the nature of the universe. Specifically the scientists are looking for the Higgs-boson particle. It is theoretical since it has never actually been detected. Some of you may remember the LHC being started up last year to some fan fair as well as some doomsday predictions by those who were concerned it would create strangelets that would devour the earth. The initial start-up had to be scrapped because of a liquid helium leak. Now, a few million dollars later they were ready to start it up again last week and had to do an emergency shut down, again. When they went up above ground to investigate they discovered a bird sitting on a equipment munching on a piece of a baguette. A crumb of the bread had fallen into the compensating capacitor and caused the short-circuit that caused the temperature rise. When the temp rose the super cooled magnets shut down and everything ground to a halt. Nice to know a 5.5 billion dollar machine can be foiled by a bird eating a baguette. The system was re-cooled and some test beams of particles have been shot at least half way around the collider. They will bring the last sections online this week and then start doing low energy collisions shortly thereafter. I'll let you know if the universe unravels. I wonder what kind of bird it was. Probably a crow from the gremlin family that was fertilizing a nut tree it had planted in the compensating capacitor ventilation shaft. It brings to mind the exposition scene in the movie 'Brazil' where a housefly causes the arrest Mr. Buttle instead of Mr. Tuttle. We are smart enough to attempt to build a Large Hadron Collider, but we didn't think far enough ahead to cover a multi-million dollar vulnerability with a dollars' worth of screen. We are an interesting lot. It is pretty surprising. I'm not too worried about the LHC producing strangelets though. From what I understand they could theoretically only be produced in a low energy environment and the LHC is actually too powerful. If the never made any with the weaker colliders they won't make any at the LHC. I tried to find out what kind of bird it was but couldn't find any info. I had heard the shut-down was due to a bird, but I didn't know the exact details. Maybe the birds know something we don't (i.e. planned the shut-down on purpose)...! Hmm, maybe if it was a Corvid. That whole clan is pretty sharp. If they had not shut down, possibly a result similar to the one in Robert J. Sawyer's novel "Flashforward" would have occurred? Oh my. I read the plot summary of that book. Sounds interesting but more fiction than science.